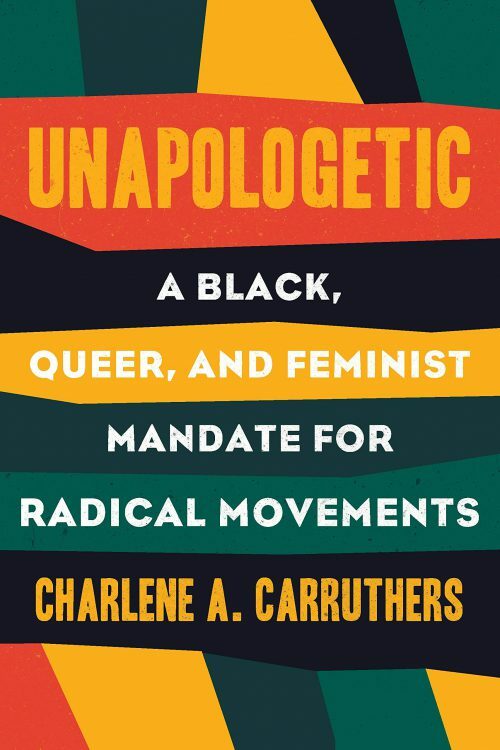 Unapologetic: A Black, Queer, and Feminist Mandate for Radical Movements was published in 2018 by Beacon Press. To say I eagerly anticipated this book is an understatement. Charlene A. Carruthers’s debut monograph explicitly builds on the work of Black queer feminists who have come before her. Unapologetic: A Black, Queer, and Feminist Mandate for Radical Movements calls on readers and movement leaders to listen to the hard-won wisdom of a young, but seasoned, organizer. Carruthers uses clear, accessible prose to invite would-be activists into the struggle for liberation, with insight forged from on-the-ground actions around the country but centered in ongoing work in the city of Chicago, Illinois. This book is for those who still need convincing that “queer” and “feminist” are the vanguard of Black organizing and not its downfall. Carruthers uses a Black queer feminist (BQF) lens to orient her reader to how she is imagining the work of collective liberation. The BQF lens refuses to settle for assimilation into the current hierarchical structure. For instance, she uses her own ambivalent feelings about electoral politics to reimagine voting as harm reduction. Given all the setbacks we’ve already witnessed with “45”’s administration, seeing voting as one strategy among many and never as an end goal helps reposition organizers on the Left to take full advantage of this political moment. Carruthers also challenges millennials’ and Generation Z’s affinities for social media, arguing that while it is potentially a useful tool, it can be distracting and take organizers away from building the relationships required for sustained struggle. She even draws a comparison between some of the FBI’s COINTELPRO tactics and the contemporary use of backchannels and BuzzFeed to spread rumors that promote organizational infighting. Carruthers cautions us to try to do the hard work of nurturing accountability offline in ways that don’t disrupt our organizing. As a scholar of social media, I bristled at the truth in those words. Social media, like any tool, can be transformed into a weapon when one has that intention, but it is also important to note the ways that social media has been a megaphone, bolstering and supporting the work of organizing in many movements. This multipronged approach builds on Carruthers’s call for collective commitments to ensure the continued growth of movement work. This book is not a memoir. Unlike Patrisse Cullors’s When They Call You a Terrorist, Unapologetic does not give detailed accounts of the life events that brought Carruthers into organizing. Though she mentions insomnia and lack of sleep as reasons behind her recognition of the need for movements to adopt healing justice in their work, readers aren’t given the tools she found or developed to aid her along this journey. Carruthers champions storytelling as a popular and accessible way to convey movement messages, but the book itself does not tell very many stories. Carruthers does tell of her own personal anguish when she had to invite a comrade, recently released from jail, into a transformative-justice process around his sexual assault of a fellow organizer. This story could have been an opportunity to share the finer details of a transformative-justice process, to provide a model that so many of us are hungry for. No doubt an omission to protect the privacy of those involved, it exposes the limits of some mediums for some conversations, much like Carruthers’s critique of social media as an untenable venue for certain types of accountability. In an effort to practice what she preaches, Carruthers alludes to the collective “we” and “us” that that exemplify the first of the three collective commitments she elaborates in the book—a commitment to building many strong leaders. She references many of the movement elders, ancestral and living, who inform her activism and organizing. But in so doing, we miss some of the unique insights that only she can offer, particularly her role in turning BYP100 into an internationally recognized organization making important strides for justice in Chicago and beyond. And speaking of strides, Carruthers truly hits hers at the end of the book. Though she jokes about not enjoying poetry, the conclusion reads as such, as she calls for “our collective imaginations [to] burst open in order to believe that liberation is possible.” I wanted more stories of how she cultivates that “bursting open,” how she tends to her radical imagination, and how she supports her own healing, but I suppose that’s for another book or another medium. 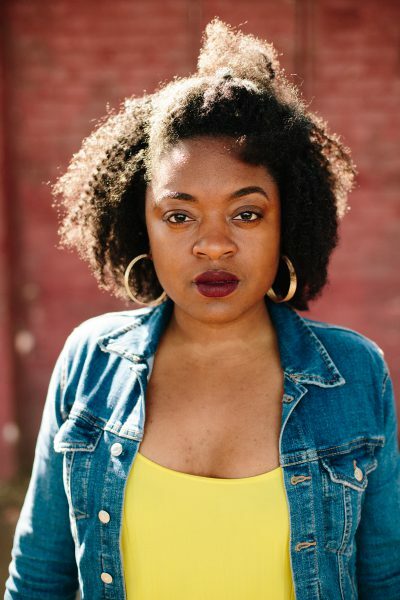 Moya Bailey's work focuses on marginalized groups’ use of digital media to promote social justice as acts of self-affirmation and health promotion. She is interested in how race, gender, and sexuality are represented in media and medicine. She currently curates the #transformDH Tumblr initiative in digital humanities. 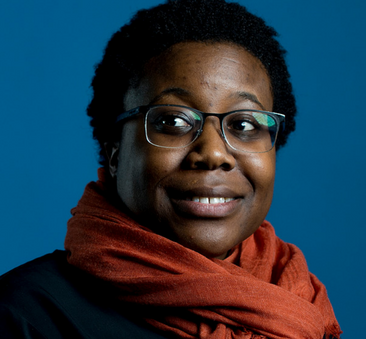 She is also the digital alchemist for the Octavia E. Butler Legacy Network. She is an assistant professor in the department of Cultures, Societies, and Global Studies and the program in Women's, Gender, and Sexuality Studies at Northeastern University. Applying a Black queer feminist lens to our understanding of violence allows people concerned with collective liberation to have a deeper understanding of what is happening to our people. The lens helps us to understand how state and interpersonal violence operate across our lives. The BQF lens enables us to see how violence within our homes, communities, and a broader society are connected to the violence inflicted upon us by the government and corporations. A more complete view of what happens in our lives will lead to real solutions instead of just bandages and work-arounds. I begin with a lengthy quotation from Charlene A. Carruthers’s trans*disciplinary and trans*spatial text; meaning, it is a text that aids in understanding how violence works on different scales, from body to home, community, urban, region, nation, or global. In her chapter “Reviving the Black Radical Imagination,” Carruthers provides her reader with the definition of a Black queer feminist (BQF) lens. This definition anchors the current iteration of Black liberation, better known as the multiple collective formations housed under the ever-expanding and expansive Movement for Black Lives. The Movement for Black Lives is an umbrella term aimed at naming multiple kinds of organizing in the name of Black liberation; BYP100 is one of those groups. Carruthers is a founding member and the national director of BYP100 (though there will be new codirectors starting in 2019). Unapologetic provides its reader with a global and local political analysis of freedom through a provocation of the Black radical imagination. The analysis is sharp, but it is the analytic that Carruthers elucidates through her use of a Black queer feminist lens that is so necessary for right now! In her book Unapologetic: A Black, Queer, and Feminist Mandate for Radical Movements, Carruthers beautifully weaves an intergenerational and diasporic narrative of freedom dreaming, which includes examining the Haitian Revolution alongside present-day formations like Southerners on New Ground. The mandate that Carruthers presents to the people, to the reader, is to reexamine history so that we can reunderstand and reimagine our collective futures. This is no simple reexamination, which is why Carruthers shares with her reader the gift of the Black queer feminist lens. This lens asks its users to develop an openness to seeking deeper understanding. A BQF lens requires a willingness to be present with and for the collective, and for yourself, especially when you don’t know a thing. This lens encourages its users to lean in to the mystery of what could be instead of resting in the misery of what is our current national and global dis-eased condition. The BQF lens provides those of us who dabble in history, or those of you who are historians proper, a link to understand how it is we move from the ’60s and ’70s civil rights and Black liberation movements, internally riddled by misogyny and patriarchy, to a current Black liberation movement not free of misogyny and patriarchy, but uniquely inclusive this time. Something has changed! Carruthers documents this shift; her chapters and sections move from “Killing the Black Radical Imagination”to “Reviving the Black Radical Imagination” to “Reimagining the Black Radical Tradition.” This time, a majority of Black liberation formations challenge the misogyny and patriarchal assumptions that have been internalized by so many of us. It is a doing and an undoing, a process. The BQF lens allows us to wrestle with history in new ways, such that we can come to know differently our Black radical histories. With her reimagining of the Black radical tradition, Carruthers looses a genealogical and epistemological b(l)ind that disallows those desiring to understand this current iteration of Black liberation from omitting the ’80s and ’90s. This kind of myopia causes some scholars and thinkers to ask, “How did this movement for Black people become so queer and feminist?” You would only ask that question if you weren’t considering the impact of the ’80s and ’90s thinking, organizing, and being that have impacted the movement this time; for it is in the ’80s and ’90s that we find many of our Black feminist and queer ancestors and transcestors, such as Audre Lorde, Assata Shakur, Ella Baker, Essex Hemphill, and Marsha P. Johnson. The Black radical tradition “extend[s] the boundaries of what is known and knowable” by freeing knowledge from Eurocentricity. Unapologetic is a Black queer feminist retelling, reframing, and remembering of Black queer history that inevitably changes what we think of as Black history and LGBT history. Writers, thinkers, and cultural producers in the ’80s and ’90s were searching for reflections of themselves in a moment of multiple crises—AIDS was spreading fast and bringing both sudden and slow death to many communities, especially Black communities, who were already facing extreme unemployment rates, homelessness, lack of access to adequate health care and education, Reaganomics, increasing rates of incarceration, increasing rates of drug addiction brought on by the saturation of crack cocaine, and a whole host of other barriers. These barriers’ conjunction with the AIDS epidemic made the stakes for history that much higher. Local Black and queer and trans* histories provide examples of the infinite lives and iterations of the counternarrative. Representation and (re)production are components of history’s making (histories-making) that indeed challenge the death that came for and still comes for our communities. Carruthers taps into a radical historical practice, and it is the Black queer feminist lens that activates this endeavor. The BQF lens is a tool to guide us toward a deeper understanding of our past, present, and future. May we all be encouraged and inspired by Carruthers’s book. May we all use this text in our feminist and radical classrooms. This work is necessary for right now. Carruthers has done the work: the being, doing, writing, and research. She has given us something to hold on to, something to wrestle with. It is our duty to use the brilliant text! Teach it! Question it! Let it inspire you and those around you to become differently! Avery F. Gordon, “The Black Radical Tradition and the Academy: The Future of Radical Scholarship,” Race and Class 47, no. 2 (2005): 82. Josh Sides, L.A. City Limits: African American Los Angeles from the Great Depression to the Present (Berkeley: University of California Press, 2006): 201–5. Dr. G or Kai M. Green is a shape-shifting Black queer feminist nerd; an Afro-future, freedom-dreaming, rhyme slinging dragon slayer in search of a new world; a scholar, poet, facilitator, filmmaker; and an assistant professor of women’s, gender, and sexuality studies at Williams College. An interdisciplinary scholar, Green employs Black feminist theory, performance studies, and trans studies to investigate forms of self-representation and communal methods of political mobilization by Black queer folk. 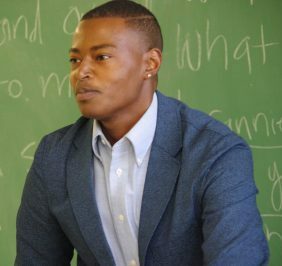 Dr. G is currently working on an anthology series entitled, “Black Trans Love is Black Wealth.” Green is a proud member of Black Youth Project 100 (BYP100)and sits on the healing and safety council. We are living in times that call for ideas and actions that do more than tinker around the edges. The continued suffering caused by capitalism, environmental degradation, patriarchal violence, and anti-Black racism demands nothing short of transformative social justice movements. I was personally transformed in writing Unapologetic, and my deepest desire is that its readers are agitated into transforming themselves and the world we all live in. I want each reader to engage in critical inquiry, ask new questions, and commit to long-term struggle. If that happens, then I’ve done my work as an organizer well. Admittedly, I felt a weight on my shoulders to produce a work that would both stand the test of time and be useful in this moment. I understood the urgency of now and the necessity of being forward looking as I wrote and made tough decisions about what to keep and what to throw away. Moya Bailey and Kai M. Green’s assessments of the final work reveal so much about what I intended to offer and was I able to create. I did make choices to be vulnerable in some areas and withhold in others. Unapologetic is a reflection of where I allowed my imagination to take me. Bailey rightly identifies many of what I think of as “stopping points.” There were places I would not and could not go. Unapologetic is not a memoir—I was adamantly against the idea of writing a memoir at this time in my life and development. Honestly, at times my personal traumas and need for further political development influenced how far I decided (and was able) to go. This signals the self-work I still need to do as a Black woman, writer, and intellectual. I actively chose to not approach this work as a martyr. Black women are often encouraged to express the personal in our political work by bleeding out our trauma onto pages. I pulled out stories and experiences that would help drive the central themes of the book—of reimagining, of transformation, and of presenting a leftist politics for those who don’t fit the mainstream mold of what a radical intellectual practice looks like. I set out to write a work of history, theory, and practice. I felt that putting my intellectual labor toward explaining the Black queer feminist lens and highlight stories that are less known in social justice movement space was valuable enough. I feel seen by Bailey and Green. I appreciate two Black scholars valuing this contribution and sharing such genuine reflections; it feels like love in public. Thank you for engaging me in this series and expanding the Black radical tradition as creators and keepers of knowledge. I urge more radical Black activists and community organizers to write, because writing endures. Writing endures beyond the individual. Once it is released, we no longer own it, and that offering is our responsibility. We are carrying on the work our ancestors began a very long time ago. Charlene A. Carruthers is a strategist, writer, and leading community organizer in today’s movement for Black liberation. She is author of bestselling book, Unapologetic: A Black, Queer, and Feminist Mandate for Radical Movements.